Jammu and Kashmir Bank had issued the Notification for the Recruitment of Relationship Executives early this month.The Online Registration are going on and the Last date to submit the JK Bank Online Application 2015 for Relationship Executive Jobs is 16th April 2015.If you are new to this page and would like to know more about Relationship Executive Jobs in J&K Bank, then, you must go through our previous post on JK Bank Recruitment 2015, in which we have provided complete details about the JK Bank Jobs 2015. Since JK Bank Relationship Executive (PO) Exam is conducted after a very long time, so it is getting attraction from most of the graduates of the State, who are Looking for Bank Jobs in their Home State.In this Article, we will discuss about the JK Bank Relationship Executive Exam Syllabus and the pattern of Exam. Why JK Bank Does It? This is such a mismanagement of the part of the bank, that it is not providing the timely and complete information to the students, and the students will have to run from pillar to post to know about the Syllabus and Exam pattern.As we have seen in the Other Bank's Recruitment Notifications, there is a complete information about the Number of vacancies, Syllabus and Exam Pattern, Exam Dates and Selection Procedure .It is high time that bank must think in the interest of the students and provide the timely info so that they can start preparing for the exam without any delay. So, it took more than an year for JK Bank to select 1500 candidates. I think, now you agree with me on this that its the Laziest among all the Banks in India. 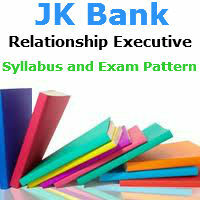 How to get the JK Bank Relationship Executive Exam Syllabus ? At first, you must make sure that you submit the Online Application before the Last Date ie, 16th April, 2015. Candidates who want to Know the Syllabus of the JK Bank Relationship Executive Exam are required to take following measures. Email JK Bank : Candidates are required to send Enquiry Emails to JK Bank @ recruitment@jkbmail.com .This email is mentioned in the JK Bank Relationship Executive Notification. Contact Them : Candidates can also paid a visit to the HR Department of the Jammu and Kashmir Bank at the below mentioned address. If any one from the JK Bank is reading this article, then, we request the authorities on the behalf of the candidates to Upload the Syllabus and Exam Pattern of the JK Bank Exam 2015 on the Official website or made it public through Print Media. Update: As soon as the Relationship Executive Syllabus for 2015 is uploaded by the JK Bank, we will also publish the same on this page.So Bookmark (Control+D) this page, so that you can open it as and when required. Today, J&K Bank had officially announced the Exam Dates and Syllabus for RE Exam 2015.